Bamboo phyllostachys pubescens Moso, is the largest and most handsome of the runing bamboos. Native to China and Japan, in warm regions it may reach 70" and have a diameter of 15". In cooler zones it will be shorter and can be grown in container. The stems have many uses. Running bamboo species are widely planted for fast growing erosion control, privacy screens, and wind breaks, and the bamboo can be trimmed to the desired height. 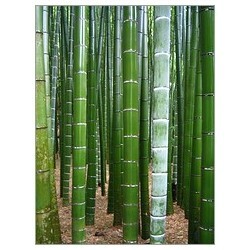 Moso bamboo have relatively small green leaves, 4-11 cm long, 0.5-1.2 cm wide. It is in leaf all year. 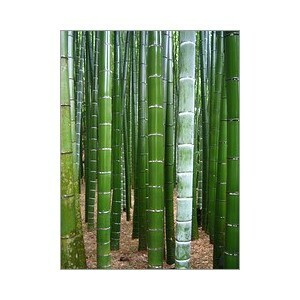 Bamboo stalks emerge largely in the Spring with a consistent diameter that each individual pole stalk will always have. Each year, as the bamboo root mass grows larger and stronger, larger and larger culms will emerge until it grows to that particular species' maximum diameter. The young shoots are very fast growing, up to 30cm per day.The running bamboo species spread by underground rhizomes that extend into a 360 degree growth pattern, and can grow indefinitely. Rhizomes grow mostly horizontally and undulating in top 15-40 cm soil. This is a good companion species to grow in a woodland because the plants are shallow rooted and do not compete with deep rooted trees. Hardiness zones 7-10, (1ºC/35ºF, -15ºC/5ºF) in Winter. Ideal growing temperature is 72ºF and higher. Use a 60 cm deep fertile loam, moist but well drained. 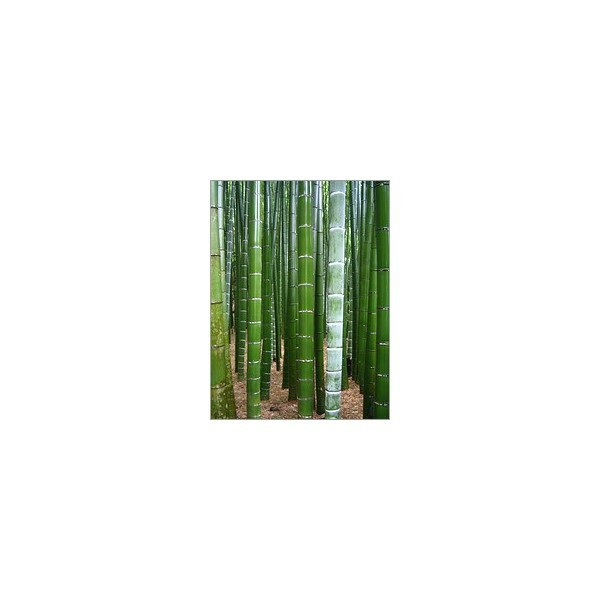 Bamboo in general is not particular concerning soil type, although a neutral soil. Bamboo can also tolerate full sun or partial shade conditions. The key factor for moso bamboo growth is rainfall. Germination Surface sow as soon as possible at about 20°C. Grow in a lightly shaded place. Do not allow the compost to dry out. Germination usually takes place fairly quickly, it can take 3-6 months, maybe more, don't give up.